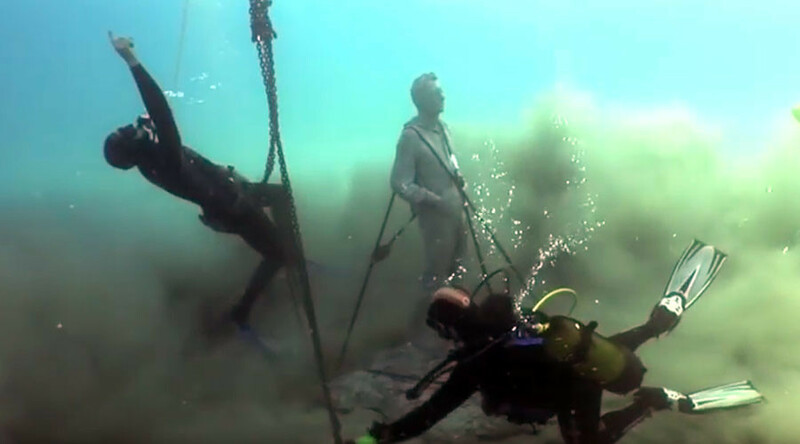 An underwater museum has opened deep in the ocean off the coast of Lanzarote in the Canary Islands. The Museo Atlantico presents a strange human world on the ocean floor, but will only be visible to scuba divers and from glass bottom boats. Created by Jason deCaires Taylor, Europe’s first underwater museum is a result of two years of work and features human figures, some modeled after locals in the area. Once fully complete, the Museo Atlantico will feature 300 individual human sculptures and 10 large-scale installations. The aim is to attract sea plants and animals to portray the relationship between humans and nature, and encourage breeding, as the area has been designated a Biosphere Reserve by UNESCO. Many of the figures appear to be walking, while others have a more animated pose, like the couple taking a selfie, and in The Raft of Lampedusa, which reflects the refugee crisis, named after the Italian island. The models were made using safe, PH neutral materials. The exhibit is both a nod to those who succeed in life as well as those whose “dreams and hopes remain at the bottom of the sea,” deCaires said. DeCaires has created other underwater worlds in the past, with his Grenada creation making it on National Geographic’s Top 25 Wonders of the World.